Several people have asked for “how to” trainings, so I decided to create a new tutorial showing you how to create Unpublished Page Posts using the Power Editor. This will allow you to test many different combinations of ads without cluttering your Fan Page. Thanks James for this training. I had no idea this was available. I will surely be taking advantage of this fairly unknown feature which can help our ads be more effective. Great post and website. i suggest that you put an iframe to your photos and images in your website and for your landing page of the sidebar to make the background different from the white background of the site. One million is a good start. However, they don’t need to be in a single ad set. If all of your ad sets total one million, that will work too. What about for local marketing in which sometimes we have only 1 thousand Potential Reach? What would be a solution for this problem? 1 thousand would be a good start as well? Good point Glenn. Thanks for chiming in. 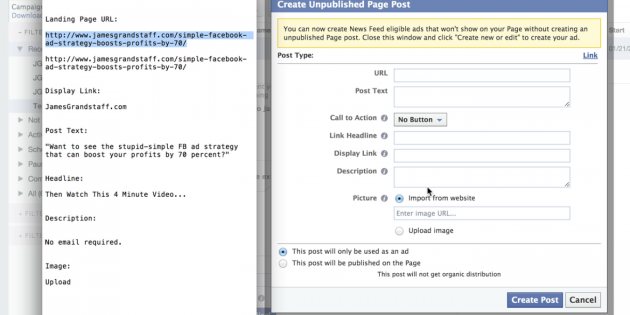 Why would you use an unpublished page post vs an ad that appears in the news feed? i.e. When I create ads they don’t appear on my page newsfeed. Unpublished Page Posts do appear in the Newsfeed of the audience you are targeting. Where they do NOT appear is on your Fan Page. This allows you to test different ads without cluttering your Fan Page with dozens of ads. Hope this helps. I saw in the message above that 1million is a good start and for local the size doesn’t matter. It implies that for NATIONAL de size matters for Potential Reach. What would be a good start for National Potential Reach? How could we use some of your systems for non-profits? and how did you do the cool highlighting as you were instructing? Hi Alana, the strategies are all the same whether it’s for profit or non-profit. Thank you for this video. If I just want to create an unpublished post using power editor but already have existing ads running in the ads manager will downloading the power editor change anything I already have running in the regular ads manager? I’d like to not change any of that but just try a dark post. I know it will download your ads into power editor but for the existing ones would I have to confirm anything or click anything to have them continue or will they just keep running as they have been (which is what I want)! Many thanks for your very good info video which makes me to watch again and again. I have notice that when you create the web conversion add, on the bottom of the add there is a ” LEARN MORE” button and there is no “LIKE PAGE” button on right top corner. When I create the web conversion adds, i can get the LIKE PAGE button on right top Corner and rest is same. Can you please let me know how its not coming in your advertisment ? or is it added in the new version of advertisment ? It looks like this method for creating dark posts no longer works, are you planning to do an update video? The new process seems to be a bit easier, but most people won’t realize the new process until they get halfway through the process of creating one. About half way through I show you how to create a dark post with the new changes.